Full Sleeve, XV Century, Cotton Arming Doublet, Size M, Black - this item is being discontinued and priced to sell!! 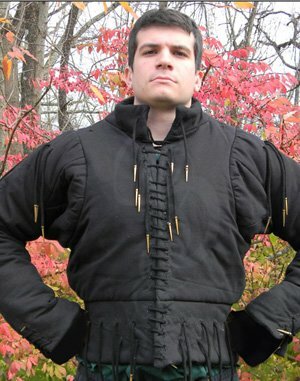 Full Sleeve, XV Century, Cotton Arming Doublet, Size L, Black - this item is being discontinued and priced to sell!! Full Sleeve, XV Century, Cotton Arming Doublet, Size XL, Black - this item is being discontinued and priced to sell!! This comfortable cotton garment is one of the most striking examples of what was worn under armour during late Middle Ages. 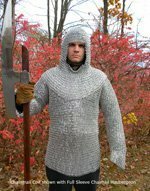 With the development of more and more protective plate armour the need of heavy padding slowly diminish. Of course, heavy jack/aketons were still needed by common foot soldier who used them alone or with mail & small amount of plate but heavily armoured knights begin to wear something lighter. 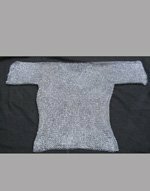 During XV century it has become fashionable to wear a heavy "garming pour point" or "garming doublet" strongly built, sometimes reinforced with leather bands, and including numerous eyelets to tie armour part and mail (voiders, collard & skirt). This kind of military garment was also sometimes worn in civilian clothing and was widely found in accounts and inventories of the XV century France. Arming caps are worn under a helmet or chainmail to give full comfort and protection for the weare's skull. 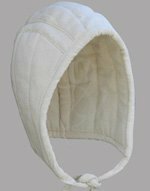 They ensure a snug fit and help in absorbing the shock of an impact. 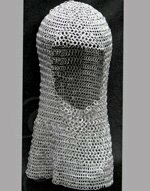 They also offer protection against the friction of a chainmail coif against the head. Weighing almost 0.3 kgs, our standard size arming cap fits almost all and is available in black & ecru color. (9) Width of the shoulder (from collar to sleeve).